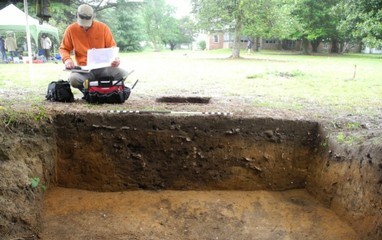 The Eyreville Site (VA Site 44NH0507) in Northhampton County is found on the grounds of a plantation house dating from the late 17th-19th centuries. The plantation's extensive farm lies along the beautiful Chesapeake Bay and is easily reached from the main highway. We will be testing a site that lies to the west of the main house where, during earlier studies, the removal of a tree stump revealed numerous artifacts dating to the 17th century. These included rose head nails, bricks, blue and grey stoneware, tin-glazed ware, gin and wine bottle fragments, and numerous pipe stems. During the 2017 field school, other features were located including an 18th century brick foundation, a buried hearth, many oyster filled features, a brick walkway, and other historic features of note. The excavations this spring will emphasize a view of diachronic change through time, which will illustrate changes in both architecture and material culture. See you this spring!